Every bargain hunter looks for that piece of art that will someday put them on The Antiques Roadshow, preferably getting an appraisal for a “find” that makes you jump up and down with joy, rather than the ones that unfortunately discovered as over-valued and over-paid. Art is especially tricky, unless you are an art expert and even then there are fields of expertise within the various forms of art and periods. However, this does not stop looking and going to those estate sales, thrift stores, flea markets, rummage sales, auctions and, online auctions. Online auctions are especially risky since the other bargain hunting forms allow you to inspect the item in-person to see if it is an original, reproduction, or fake. Some easy ways of identifying an original from a fake among drawings or prints is to look for raised lines from ink such as in an ink and pen drawing, an etching, or a wood block print. Many famous prints can be reproduced by a computer and printer; however, you will be able to tell that with closer observation–you will see the pixels or dots, a clear indication that the print was reproduced on a computer. Again, online auctions prevent such verification unless the entity or person putting the piece of art up for bid describes it in detail, and then again, trust comes into play. Additionally, you can see if the print has an artist signature or any documentation or stamps, provenance, as to its’ authenticity. Given all that, sometimes it is worth the risk if the item is within your means, and you have done as much research as possible. The current bid will determine the extent of your research and whether or not you will want or need to seek the advice of an expert. There are blogs that can assist you in finding answers on value, one is Antiques and The Arts Online a forum for bloggers. However, if the item is not terribly expensive, you just may want to take a chance–sometimes hunches, preferably educated hunches pay off. 1st etching is titled: Shakespeare House and 2nd etching is titled: Ann Hathaway’s Cottage. Both are titled and signed below the art piece above the matting. The sticker on the back indicated these are original etching by C. Dickens. There is no pixilation and when looking closely the lines appear to be raised. They were received in a wooden frame with glass over it. The frame measures: 9 ½” x 12 ½” and the art itself measures: 5 ¼” x 3 ½”. The matting has yellowed, the frames finish is worn, the paper backing on both frames are torn and appear to be delicate. The starting bid was $5.99. 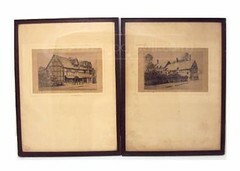 Take a look at these etchings, what would you bid for two etchings possibly by Charles Dickens? Check Back This Week at this post to see what The Final Bid was and whether it was a Deal Or No Deal. 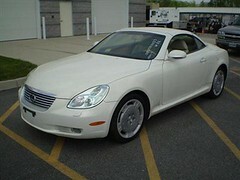 Final Bid: The winning bid was $601.00 plus $40.44 sh, 41 online bids at shopgoodwill.com. It is difficult to determine whether or not this is a deal since an object such as this should be inspected in person; however, having said that with a cursory investigation online although Charles Dickens was not known as an artist, he did direct artists and had input into the drawings for his serial novels. It is up to the individual to determine if the amount risked here was justified . Tip Of The Week #56 Bad Gift? How To Exchange, or Sell The Mistakes of Christmas Past! Ebay®. 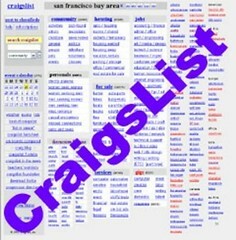 Plus: Many items no longer needed or wanted by their owners find their way onto this auction site. Not a bad idea. Potential Downside: you will give a cut to Ebay, and it involves setting up an account, etc. It is an auction site. Craigslist. Plus: No middle person, potentially faster sale since you can sell it to a local party, reaches a wider market than waiting to hold a yard sale to sell your gift. Potential Downside: you will have to be responsive to the inquiries about the item either through emails and/or phone calls and there can be crank calls, etc. Bad Gift Emporium. Really bad gifts go here to hopefully find a new home. Photos of items are ranked by the site, listed by availability, and most recent offerings. Plus: Can turn out to be a place to unload that gem. Potential Downside: More a place of commiseration, rather than a marketplace. At least you will know you are not alone. Gift Card Rescue. Site dedicated to the sale of or exchange of gift cards. Plus: If you can’t sell your gift card you can exchange it from their lists many times at a 35% savings. Potential Downside: As with any type of internet deal, depending on what option you choose, processing time may vary. Swaptree. Trade books, dvds, music, or videos for free. Plus: site takes the guess work out of sending your item in for exchange by printing label online. Potential Downside: Not completely free, you will pay for shipping. The retro look has been popular for several years now in home decorating. I’m old enough to remember a chenille bedspread on my bed that had a dancing ballerina. 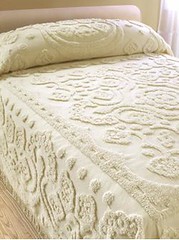 Chenille bedspreads are a great summer look for any bedroom. Although the more intricate colored patterns are more collectible, I like the plain one color versions for elegance and simplicity in a room. Now the DIY decorator has options for getting this look. Ebay®. Ebay has a diverse selection of vintage chenille bedspreads. You can get some real bargains, but again you have to savvy and quick in your bidding. Don’t forget to look at chenille material for making coordinated pillows or lampshades. The Vermont Country Store® sells reproductions of vintage chenille bedspreads ranging in price and according to size from $69.95 up. Nancy’s Notions® carries the notions to make your own chenille quilts,apparel, and accessories. You can create your own original to be cherished as a keepsake for years to come. Hot Look For A Cool Summer! Silent auctions for a number of years have been a staple of charity fundraisers. Less raucous than the give and take of real auctions, nonetheless they provide an additional source of raising money for charities and other worthy causes. These auctions have been coupled with charity events such as wine tasting, chef prepared samplers, dinners for special causes, to name a few. The tax incentives usually include the price of the event’s ticket and the silent auction prize minus the value $$$ of each. Now some thrift stores have caught on to this fundraising vehicle by conducting their own in-store silent auctions. Usually thrift store donations for auction include the more expensive donations the organization has received. For instance, on a recent visit, MDM found a copy of a Jackson Pollock print matted and framed, a animated cell from a motion picture studio, a TIVO® NIB and other various electronics, and more. How does the thrift store silent auction work? Each store has the bidder fill out a registration card, that is only good at that location, with an assigned number. The items up for bid are usually showcased in a locked glass cabinet with an assigned number. Once registered, the bidder then can make a bid for the item by logging it onto the item’s sheet in a designated 3 ring binder, and listing his/her assigned bidder number and bid amount. The bidding sheet includes a description of the auction item, opening bid amount and bidding increments, its’ opening and closing date–usually a one week period. It’s important to check back often especially on the last day of bidding. Bidders need not be present since the registration card includes address and phone number of the bidder in order to be contacted by the thrift store. All tax incentives of a charity event silent auction apply to thrift store silent auctions. Usually the bidder will be looking to get the item at a bargain price; however, in the case of antiques or collectibles, that price can exceed fair market value depending upon the rarity of the item, and any amount above that can be deducted as a contribution. Likewise, donating items for thrift store sale or auction is tax deductible. Another way to go green and find a bargain at the same time! 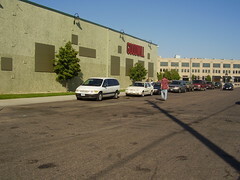 Auto Auctions Every Thursday at 9 A.M.
Markdownmom’s Twin Cities tour has begun. Today MDM visited the Easter Seals Goodwill store located in St. Paul, MN.. 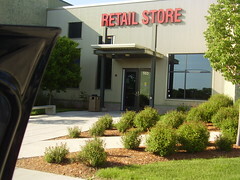 This thrift store is one of the contributors to the shopgoodwill auction site. Expansive with a large inventory of clothing, many racks are reduced on Thursday by 50 percent. Although MDM does not recommend thrift stores as a source of auto auctions, nevertheless if you have strong mechanic skills or know an expert mechanic you might want to check out their offerings every Thursday at 9 a.m.. To preview this weekly’s silent car auctions, log on at Goodwill Easter Seals. If you would like to donate your car, this store offers free metro pick-up. MDM found china and glassware a bit expensive for a thrift store and there were not displays of antique items, possibly because of this store’s connection with the national auction site. However, there were some deals on home appliances such as a BreadMan bread machine NIB for under fifty dollars and a medium cuisinart only missing its feeding tube for under five dollars. Also, selected designer items, electronics, tools, and antiques are held under glass to bid on in a silent auction. The Easter Seals store also has a large book and record collection. College students can find some inexpensive furniture pieces and art work for their apartments or dorm rooms. Special tag sales on Monday and Tuesday at these stores, and if you are 55 or older Wednesdays offer senior discounts of an extra 25% off. Open 9-9 weekdays. Handicapped accessible. There are extra savings at JCPenney Outlet. Save 30%-70% and get free shipping on purchases of $99 today. Enter "yes" on "discounts" of the shopping page. Get any extra savings by putting Promo Code:WPMAYFS, discount if applicable will appear on summary page at final checkout. And while you are at it, check out their Wednesday Deals like this prom or special occasion halter dress in popular runway navy, sizes 4-16, Reg.$120/sale$39.99! For all your favorite gourmet cooks, have them dress the part with a professional chef’s coat, reg. $52.90/sale $15.35 at Shop At Hometv.com. 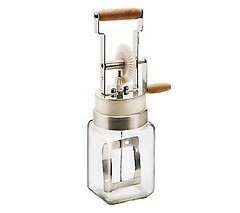 Or if your gourmet cook only wants tools like Martha uses check the sales at Chefs Catalog such as this french straight rolling pin, Reg.$13/sale $9.99. Shop NBC has free shipping on all clearance items this includes up to 70% off items. Also, if you are into auctions try Shop NBC Auction especially in the ShopNBC Listings since these items do not have "reserves," and you can get some really hot deals on jewelry, etc.